Peter Yates's flag-waving film stands with To Kill a Mockingbird and American Graffiti as one of the best films about small-town Americana. Steve Tesich won an Oscar for his semi-biographical screenplay about four 19-year-olds who don't know what to do after high school. Dave Stohler (Dennis Christopher) and his three friends--ex-football star Mike (Dennis Quaid), wily comedian Cyril (Daniel Stern), and tough kid Moocher (Jackie Earle Haley)--are doomed to live in the college town of Bloomington, Indiana, where the local kids (nicknamed "Cutters"--a derogatory reference to quarry workers and their blue-collar families) are looked down on by the uppity students of nearby Indiana University. Stohler escapes into a world of Italian bicycling, picking up the lingo, the accent, and a good share of the talent of his heroes. He is also the scourge of his father's life. The used-car salesman (Paul Dooley) doesn't understand his son's affection for bicycling or, for that matter, his pride in being a "Cutter." An odd assortment of high school friends take a year off, wasting their time together, before the call of peer pressure fades as careers and girlfriends beckon. Steve Tesich won a well-deserved Oscar for best original screenplay in 1979 and the story is still as fresh as it was then, although these days, instead of going to college, Dave Stollar would be riding his bike professionally in Europe and making millions for doing it. It's a coming of age film, with the four friends exploring the nature of friendship, peer pressure, the demands of society and the antagonism between the town kids and the college kids who come in from outside for their few years at college. If you are into cycling, there is a story about winning (and a slightly twee ending to the film), accompanied by some beautiful music as the companion to the cycle racing. I don't want to make a bigger deal out of this movie than it deserves. It's not a world-changer and the ending is a bit predictable, but it is a wonderful and charming coming of age story and an honest look at small-town America. And cycling and Italians play central roles -- a plus for an American cyclist living in Italy, like me. But having an affinity for things Italian or for bike racing is not necessary in order to enjoy this 25-year-old classic. What is necessary is an appreciation for small things and memories about the mysterious period between adolescence and adulthood. If that describes you, then chances are you'll enjoy this touching film. Amid the praise I should say that the DVD package is only average: the original trailer and teaser are there, but it would have been nice to have some commentary from director Peter Yates, some of the actors, or from critics who were fans of the film. A "Making of Breaking Away" mini feature would have also been a welcome addition. A sleeper that made the grade and graduated into the realms of Classic Flicks, Breaking Away is one of those wonderfully uplifting and subtly patriotic movies that champions small-town America. Steve Tesich won the screenplay Oscar for this semi-biographical story about four 19yo kids who can't quite decide what to do with themselves after high school. They live in Bloomington, Indiana, where the guys from the university look down on the townies and make derogatory comments about their rock quarrying forebears. One of them drifts, then runs, into the world of Italian bicycling, much to his used-car-salesman father's dismay and embarrassment. Despite the "shown-on-TBS-in-the-afternoon" feeling to this movie I actually love it, and like it more every time I watch it. First of all I love bikes, and I love Europe, so I immediately had something in common with the protagonist. But really all the characters are identifiable in some way. Now it seems that even college kids are finding that their lives seem aimless, and the movie seems to speak to that theme that is daunting for almost all of us. You'd think it would be cheesy, and in some respects it is, but nonetheless it's hard not to cheer for them to win the bicycle race. I do even though I know the outcome. A great classic film - worth seeing many times. 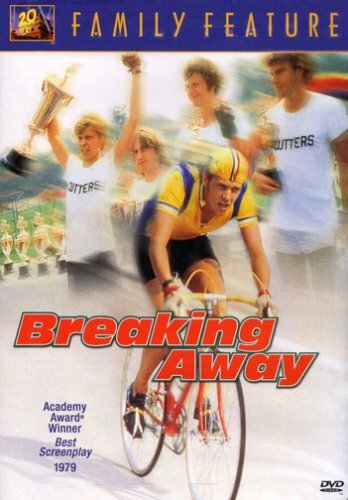 "Breaking Away" is a movie with an unusually wide scope of topics. Its plot is not confined to one theme (a seemingly-doomed romance or good versus evil, for example) but instead almost seems to tackle life itself; or at least, life as it is for bike-riding, Italy-emulating Dave and his three close friends. Each of the four pals gets his fair share of attention, and almost without noticing the viewer comes to knowyand like, for all their quirksythem all. They are united by an obvious life-long friendship, and (although they would never admit it) a thinly-veiled desire to somehow make their way into college, or at least get a job. All except for Dave, who has multiple additional goals jockying for position in the forefront of his mind: to become a champion bike-racer, earn his father's respect (or at least un-earn his father's shame) and even win the heart of a certain college girl. Unfortunately for him, he's going to learn a bit about reality along the way. I love this movie! I remember first watching it when I was about ten, and I liked it because I thought the dad was funny and the bike racing was cool. As I've matured, my views toward the movie have matured as well. The dad is still funny, and the bike racing is still cool. That hasn't changed. This is one of the most inspiring and best-told tales of growing up in small-town, USA. Solid acting, an incredibly entertaining and fun storyline, and great charaters. Though it's not just about biking, this movie is able to somehow capture the joy of biking - the thrill of self-propelling oneself over the concrete and through the air on a simple, silent machine you hard even know is there. Definitely a must-see for any film fan. A real crowd-pleasure, too. Good for everyone in the family, maybe like one swear word and no violence to speak of. This is a fabulous film, one of my all-time favorites: a funny, bittersweet, character-driven masterpiece of small-budget filmmaking, shot in a town I lived in for five years. Obviously, this was a cheaply done DVD release by Fox of a film that deserves a deluxe special edition. Besides the lack of extras, interviews, and audio commentary, I could not believe the poor sound quality of the DVD digital transfer: street scenes, crowd scenes, etc. sounded like they were recorded in a digital bucket! We had to turn down the sound during the pivotal Little 500 scene, because the digital garbage was so annoying. Having seen this many times on tape, I know that the sound of this low-budget film was not always good, but it was never horrible until this cheap digital mastering. Fortunately it does not completely ruin the experience of this wonderful film, but I wouldn't be in any hurry to replace a VHS tape with this DVD! I bought this movie after my purchase of a Walz cycling cap caused my wife to say, "You really need to see breaking away." Ostensibly a cycling film, the story is centered on four friends who've made a pledge to waste their lives together after high school. The lure of the real world is too strong, though, and they must choose between rising to the various challenges they face or falling back into a life of obscurity and regret. It's all about the journey for these four young men. They can't make 'em like this anymore. "Breaking Away" is a true rarity: a feel-good movie that doesn't that isn't silly. Yes, there are plenty of laughs in it, but they're the result of great acting and writing, not the cheap, crude one-liners that litter so many of today's so-called "comedies." And while the movie will tug at your heartstrings, it never spills over into gooey sentimentality or empty pathos. But I also feel sort of sad whenever I watch "Breaking Away." The small-town downtown where the guys hang out is just a fading memory for most Americans. And are there any old swimming holes anymore, like the quarry that the characters visit? Or have they all been paved over, for "luxury" McMansion subdivisions? The most serious part of the movie puts the small town feelings in perspective. The father (the same actor who had the serious talk with Molly Ringwald in "Sixteen Candles") has a great talk with his son - the lead character - about life and growing beyond your roots. A fun and enjoyable flick. Nostagic Horatio Alger on wheels. For anyone who feels the need to cheer for the underdog and listen to lots and lots of Italian classical music and opera, this is the movie for you! This movie will motivate you to hop onto your bicycle and ride, ride, RIDE!!! An excellent film with really funny scenes of growing up in the 70's. For a Brit of 31 years I grew up on films like this so this is my view of the U.S., probably a little rose tinted, but I don't care. If you liked American Grafitti, E.T., Stand By Me, The Goonies, Etc you'll love this, and if you like cycling you'll really love it as it has some great stuff, a nice Masi bike and the 70's Cinzano team riding. Plus drafting behind the team lorry! I would not classify Breaking Away as a "coming-of-age" film. It is about characters who have already come of age--they have graduated high school--and do not know what to do next. They are searching for a place in the world, and for a place in their small town. Reminiscent of October Sky, which made science fairs exciting, this movie makes bicycle racing exciting. I have not talked to anyone who has seen this movie and not thought it was excellent. It would have been difficult to convince me that a movie about bicycle racing, where the climax is a bicycle race, could provoke such intense emotion and involvement in the characters as this movie did for me. I might have thought if someone had tried to describe it to me is that it was a boring, formulaic underdog sports team, but it is not that. At the end of the climactic race, I actually felt the emotion and I think cried just a little. Of course, this movie is not only about bicycle racing. Not nearly. The well-crafted character development draws the viewer in. An even rarer occurence than interesting characters is realistic characters. They have very different unique personalities that go beyond the cliches of sports films, comedies, and "coming-of-age" movies. The sly humor and warm-heartedness tie the rest together. They give you the feeling of the small midwest town and the earnestness of the four main characters. They slowly cause this movie to slide closer and closer to your heart, until even the most cynical person is entranced and stuck with half of a stupid grin on his face for the rest of the film. This is an excellent movie with several themes woven together. The main theme is a how a clique of four boys, principally Dave, feel like outsiders in their hometown of Bloomington Indiana as they search for an identity after high school. They are starting to realize that their search will inexorably pull them apart. None of the four are in college, and Bloomington's local economy, especially the fading quarries, seems to hold little promise aside from serving the Indiana University (IU) college students. The IU students derisively call local kids "cutters" in reference to the quarries their fathers worked in. The four in fact have a favorite closed quarry as their hangout and swimming pool, and they resent it when the IU kids want them to stay off campus but feel free to invade this quarry. Two of the four had ideas for college athletics, but are aimless now that their high school careers are over and do not provide structure. There are several excellent scenes depicting their confusion and disappointment over what to do next. My favorite is when the four are watching Indiana football practice. Dennis Quaid still keeps in shape, and he says that he can't bring himself to light the cigarettes he keeps in his mouth because he can't get give up his opinion that he was a pretty good high school quarterback and should be on the college gridiron. Now he's just "20-yr old Mike". Eventually he will be just "30-yr old Mike" and then just "40-yr old Mike". Every year there will be new contenders for starting quarterback, and "every year it's not gonna be me." Daniel Stern, as Cyril, has to overcome his dad's low expectations and too-willing acceptance of failure even though Cyril is a talented person. Meanwhile, Dave, like many adolescents, has a silly, romantic ideas of what he will become. He decides to transform into an Italian because his passion is cycling, and because he believes Italians are the best cyclists then he should become Italian too. Dave is played by Dennis Christopher, who was raised Catholic in Philadelphia and has a real last name of Carelli. So Dave adopts an accent, listens to Italian opera and language records, calls the family cat "Fellini", and teachse his parents about supposed Italian family values from what seem to be the 1920s. His dad is adamant as he addresses the cat: "Your name is Jake, dammit!" Dave's struggle with and eventual reconciliation with his dad provides about half of the movie and comedy. His dad, who is no great role model himself, has conflicting ideas of what Dave should become, The dad does not realize that he is silly himself with what he does and should expect more from Dave. The actors, Paul Dooley as the father and Dennis Christopher as Dave, are so convincing that according to IMDB they have played father and son on three occasions! The father is the funniest person in the movie; so funny that you forget the poignancy of what is happening. Several scenes are so unforgettable that I still think of them, for example when I hear the word "refund!". After you see the movie you might do the same. Another theme, already alluded to, is that of the townies vs college kids. A colleague of mine used to live in Bloomington, and she says this rivalry is profound. The four are able to fight back against the college kids by representing the townies in the the "little 500", a bike race which is a huge event on IU's campus. Apparently IU has built a new stadium for this race because it is so popular. Oh yes, this is also an underdog movie about athletics, in this case cycling. We see Dave's cycling career cycle up and down throughout the movie, culminating in The Big Race. Two of the actors, Dennis Quaid and Daniel Stern, were up and coming, while one, Jackie Earle Hailey, had seen better days as Kelly Leak in "Bad News Bears" but still gets roles. According to IMDB, Dennis Christopher has had a productive career mainly on television. Great movie, especially if you are a bicycle rider. This movie is sort of a cult classic for biking fanatics. It's comical, inspiring and gets to the true nature of a youth wanting to 'break away' from the ordinary. I remember it peaked my interest in mountain biking. If you love movies where the underdogs claw their way up, you'll love this one.